England - and particularly London - is known for its rainy weather, and accordingly regarded as a city of umbrellas. 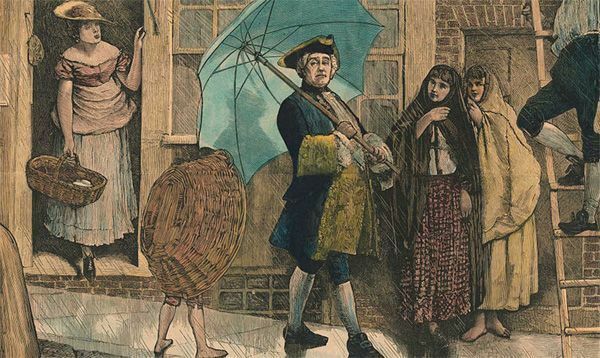 So it should come as no surprise that it was an Englishman - Jonas Hanway (1712-1786) - who made the umbrella as we know it today popular. Hanway’s memorial plaque in Westminster Abbey honours his commitment to abandoned children and prostitutes, but does not mention his ground breaking service to the rain umbrella. It should be noted that before people in England and elsewhere used umbrellas to protect themselves against the rain, the "portable roof" was employed primarily to provide shade from the sun. The English word "umbrella" reveals this original function, as it derives from the Latin word "umbra", meaning shadow, with "umbrella" being a poetic word form meaning "little shadow". Regardless of whether its function was to ward off the sun or rain, umbrellas were considered purely a feminine accessory. This was brought to a commendable end by the London tradesman Jonas Hanway who made the umbrella into the indispensable companion of the British gentleman. Around 1800 an umbrella weighed around 10 lbs., as its frame consisted of wooden rods and whalebone. Even Wellington, the victor of Waterloo, owned an umbrella made of waxed canvas which included a rapier hidden in the handle. And again an Englishman, Samuel Fox from Sheffield, at the time of Her Majesty Queen Victoria, invented the steel frame in 1852 which reduced the weight. Due in some part to tariff-free raw materials from its colonies, England was able to produce inexpensive umbrellas - with production costs often below a penny. In Charles Dickens’ novel "The Pickwick Papers" voters in Eatonswill were bribed with expensive gifts for their wives in the form of "45 green umbrellas for seven shillings and sixpence". wn. Whether gold-plated or in sterling silver, leather, horn, precious woods and cane, such as whangee and malacca, or with an integrated flashlight, pencil, watch, pill box, compass or drinking glass, almost all still exist. As early as 1715 the Parisian manufacturer Marius proclaimed the invention of the pocket umbrella, and in the 19th Century there were many attempts to make the umbrella easier to transport. In 1852 John Gedge announced a self-opening rain umbrella from Paris. The real break through, however, was realized in the 1920s by Hans Haupt in Berlin. He constructed the first telescoping pocket umbrella (up to then all small umbrellas had been foldable models), and with it founded the Knirps company in Berlin ("Knirps" is a German word with the meaning "little guy". The "Knirps" then began to revolutionise the world of umbrellas. In 1936 another innovation hit the market from Germany, the first automatic pocket umbrella with the name "Lord & Lady". With the beginning of the 1950s the rise of the pocket umbrella began, and the "designer umbrella" as a fashion accessory fell behind due to the needs and desires of the travelling automobile society. The small wonder umbrella "Knirps" experienced a real boom during this decade. This trend was reinforced during the 1960s with the introduction of nylon fabrics, which could be manufactured in an unbelievable variety of colours and patterns. The rain umbrella became slimmer, lighter, flatter, and much more durable. After a watch and jewellery, the Knirps became the standard gift for communion, confirmation, birthdays, name days, Mother’s Day, Christmas, Easter, and other holidays. Then, pressure began from imports of cheap umbrellas from the Far East, and for the "Rock’n-Roll generation" the umbrella lost its image as a status symbol. It was only during the last years of the 20th Century that innovation took off again for umbrellas. This time the new materials and functions came from the Far East. Lightweight umbrellas made of aluminium (and even out of fibreglass), new frames with a double automatic mechanism for closing and opening, new fabrics, and new coatings (such as Teflon) are changing the market. In any event, for your "portable roof" only the best should be just good enough. First, a "Rolls Royce" of an umbrella is not so easy to misplace or forget (as fear of losing it has an enormous effect on the memory). Secondly, it could begin to rain just as you are going to lunch with your boss. A fine umbrella discretely shows that you can cut a good figure even under difficult circumstances. Thirdly, such a good umbrella looks much better over time, is much more durable, and even helps protect our environment.